Thank you so much for your 'out of this world' review and for noticing the small touches to make the experience so memorable. We hope to welcome you back to our special place in Africa soon, and you are welcome to keep up to date with the latest news from Belmond Safaris, find us on Facebook, Twitter or Instagram and search for @BelmondSafaris. From the moment we arrived we were treated to first class attention from all staff but especially the managers Onx and Alex. They did everything to ensure our stay was special. The accommodation is luxurious, the food excellent and our guide Moses was a delight. We didn't expect to see big game here but were happy with hippo and crocs. The helicopter flip was expensive but a huge treat and we would recommend. A very enjoyable and memorable holiday. Thank you for your lovely review, we are really pleased that you had such an enjoyable and memorable holiday with us. Will be sure to let Onx and Alex know of your compliments. We hope you welcome you back to the lodges again soon, and you are welcome to keep up to date with the latest news from Belmond Safaris, find us on Facebook, Twitter or Instagram and search for @BelmondSafaris. We loved everything about this - our flight in a small plane from Maun to Xaxaba (pronounced Kakaba) gave us our first views of the Okavango delta and then it was a 2 min drive to the lodge with Moses, our designated personal guide. Our accommodation there was truly luxurious. We had chalet no. 2, almost the furthest away from the main area. The interior was designed to look like the interior of a tent. We had a large sleeping area with table and chairs, a bar and a sofa which could be converted into a bed. Behind was a large bathroom complete with a large black bath, a separate wc, a dressing room, an indoor shower (with seat) and an outdoor shower. 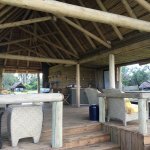 We had a large shaded deck with 2 loungers, 2 comfy chairs and table and a small plunge pool with a view over the Okavango delta. There was even a kingfisher on the railings as we arrived and it stayed still long enough for me to photograph it. We had pre-dinner drinks in the Fish Eagle bar – apparently dubbed the world’s most romantic bar by the New York Times and watched the sunset. Dinner in the restaurant was not at a communal table – guests had their own tables to preserve their privacy. Dinner was a la carte with a choice of 4 courses. Lunches and breakfasts were all excellent with a very varied choice of food. We went on several river trips and Moses very kindly lent me his zoom lens to enable me to take better photos with my camera. We loved the fact that the river level was high enough to allow us to go out on river trips rather than game drives. Thank you for your wonderful review, so beautifully written too. It was our pleasure to host you and the lodge and we are delighted that this was the highlight of your African Trip. Moses is such a special person, extremely passionate about his work and how wonderful that the water levels were high enough for you to experience the water safari activities! We do hope you will visit us again soon, and you are welcome to keep up to date with the latest news from Belmond Safaris, find us on Facebook, Twitter or Instagram and search for @BelmondSafaris. We stayed at the Eagle Island Lodge on Feb2017. You feel like royalty since the moment you arrive. We were received by the whole staff. Lynn, the manager explained to us evenrything we needed to make our stay most pleasant. I wish I could remember everyone's name but Kevin, our guides Moses and Phillip, Alex, Gatby, Mahatna( I'm sorry I now these are spelled wrong) were all excellent. 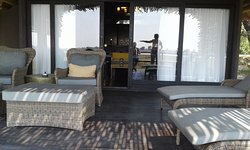 The rooms are to die for, you will not miss anything, we even had time for a massage before leaving and it was perfect. Our last night the staff sang for us and African cuisine dinner was served. Wish could have stayed longer. Thank you for these wonderful experience!! Thank you for your beautiful review, we are delighted that you were treated like family, and the team will welcome your wonderful feedback. We hope to welcome you back to the lodges soon (for longer!). 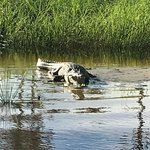 You are welcome to keep up to date with the latest news from Belmond Safaris, find us on Facebook, Twitter or Instagram and search for @BelmondSafaris. We spent 2 nights at Belmond Khwai River Lodge and then 1 night here and I wish it was reversed because the water safaris were just unbelievable. When we arrived, we went on a 30 minute helicopter safari which I wasn't all that enthusiastic about but it turned out to be a really incredible experience. You can see things from the air the you can't on the ground or in the water, like hippos in the pools. I highly recommend that experience. 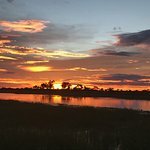 The location of the lodge adjacent to a river filled with hippos and across from huge open space where animals roam is lovely, and makes for perhaps the most beautiful African sunset ever. The game viewing is quite good though I don't think the conditions with a lot of water are good for seeing cats. 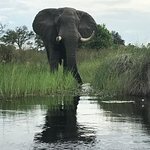 We got up close and personal with a gorgeous bull elephant, and saw lots of crocodiles and hippos. The bird life in particular is stunning and I really am not a bird person. The fish eagles are plentiful and give the lodge its name. Our room was modern and really well appointed, including a plunge pool on the front patio and both an indoor and outdoor shower. 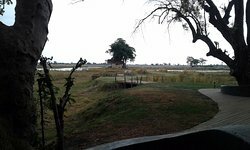 We were able to observe hippos, elephant, giraffe and zebra from our room. There is a bar near the main lodge that overlooks the river and is a great place for an evening cocktail as you watch the sun go down. I highly, highly recommend this place, even for seasoned safari goers like us because the water makes it a very different experience. The chef made me several gluten free items including GF butter cookies for a picnic which was a nice surprise. The only negative is that the food at dinner was just OK - typical of even the best safari lodges but the food at Khwai River Lodge was much better - but I never expect great food at lodges so it didn't really impact the experience. Put the Belmond Eagle Island Lodge on your bucket list, and make sure before you go that it will be during the time when water is abundant and you can go on jet boat and makoros. And definitely do the helicopter! Room tip: All rooms are amazing! Thank you so much for recommending our lodges to fellow travellers, it's reviews like yours that remind us why we love what we do so much! The helicopter safari is a must, it really allows a person to view the animals and landscape from an entirely new perspective. We are so glad you decided to take to the air and experience this! There really is so much to do and see at the lodge, and also if you just want to relax by our private pool and reconnect, this is the ideal spot. The area is not known for a high concentration of cats, they tend to follow the buffalo, but we are pretty sure you would've seen the cats at Belmond Khwai River Lodge. We do hope you welcome you back to the lodges again soon and you are welcome to keep up to date with the latest news from Belmond Safaris, find us on Facebook, Twitter or Instagram and search for @BelmondSafaris. Thank you for your review of your recent stay with us and it's wonderful that you enjoyed all the little additional touches at our bedtime turn-down as much as we did creating them, we hope you included a trip to the local village that is not far from the lodge. 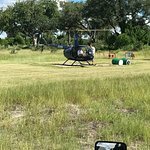 The helicopter safari is indeed one of the most memorable safari experiences as you can access areas not easily accessible by land otherwise. We are delighted that you enjoyed your safari experience, besides the bugs joining you for dinner in the evenings!